What type of mold is in my home? Utah Flood Cleanup follows advanced mold-sampling protocols; samples are then sent to the lab for analysis and to identify the species of mold present. A follow-up consultation to interpret results and address any questions or concerns will help plot our next course of action. How much mold is there? Detecting invisible airborne spores requires specialized equipment to take samples from the air. These results will determine the mold spore concentration to accurately assess contamination levels. Both indoor and outdoor samples are taken to compare mold spore levels. Can you smell a musty, unpleasant odor? When mold is in a confined area it can produce a distinct pungent smell. If you are unable to determine where the smell is coming from it could mean the mold is living behind wallpaper or in the walls themselves. Dangerous exposure happens by inhalation and absorption with direct skin contact from contaminated surfaces. Mold is common in consistently damp areas like the bathtub and shower stall. Less noticeable areas include around windows, under AC units, the basement or crawlspaces. You may be tempted to just wipe up what you see, please do not! Disturbing the mold will cause the colony to release millions of mold spores into the air. Let the pros at Utah Flood Cleanup do what they do best – rid your home of mold, mold spores and the damage it causes. Are there water stains on your ceiling or walls? 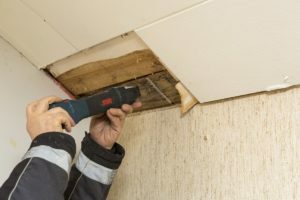 If you notice water stains on the ceiling or walls it could mean you have a water leak or leaky roof. Because mold colonies are fed by water it is likely that there is an infestation growing on the other side of the ceiling. Separately, water stains could be a result of poor insulation. Condensation caused by cold air on the outside and warm air inside produces moisture that may be contributing to mold production. Have you had plumbing issues or flood damage? If you notice a continued mildew smell after leaky water pipes or broken fixtures are repaired you probably already have a mold problem. Similarly, flood-damaged homes can quickly become a problem if the moisture isn’t immediately controlled and thoroughly cleaned. Dampness and condensation will provide perfect conditions for mold to begin growth within 1 – 10 days. Are you, family members or coworkers sick? Although those with weakened immune systems may show signs of mold exposure first, it is important to keep in mind that even otherwise healthy individuals can suffer as a result of prolonged mold exposure. Be aware of unexplained dizziness, chronic headaches, respiratory problems, burning eyes or flu-like symptoms. Are you a landlord or buying/selling a home? Mold testing ensures the property is safe, sanitary and fit to occupy. Results before closing or listing your property will give both sides piece of mind knowing that the indoor air quality is healthy and safe to breathe. The Utah Fit Premises Act outlines the responsibility of both landlords and renters to provide and maintain healthy, safe living conditions. If you answered ‘yes’ to any of the above questions, let us help! For over 25 years Utah Flood Cleanup has been providing families and business owners with cleanup and restoration from fire, water and mold disasters. Our experienced mold testing specialists will answer any questions you may have about residential and commercial mold testing. You can expect objective testing, comprehensive results, and efficient mold remediation at a fair price. Contact us or call at 801-876-5225 for immediate service 24/7. We proudly offer FREE phone consultation and FREE inspections for insurance covered disasters.